06 Nov Progressive versus native apps: When was the last time you found a no-brainer solution to a media problem? Here’s one you can take to the bank: progressive web apps. 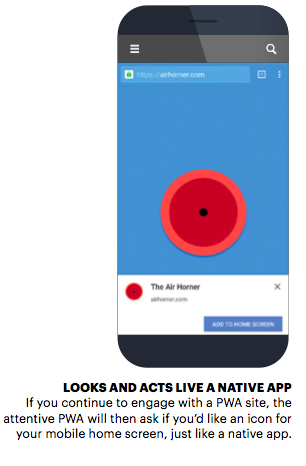 Still think you need a native app? Still believe those stats about how we spend 500 per cent of our time in apps, not the mobile web? Got US$100,000 lying around to build a native app for iOS and Android that almost no one will download and 90 per cent of those who do will delete after three months? Want to continue publishing expensive content in a walled garden for a relatively small audience where it can’t be shared or discovered by anyone except your subscribers? Then, by all means, keep feeding your native app. 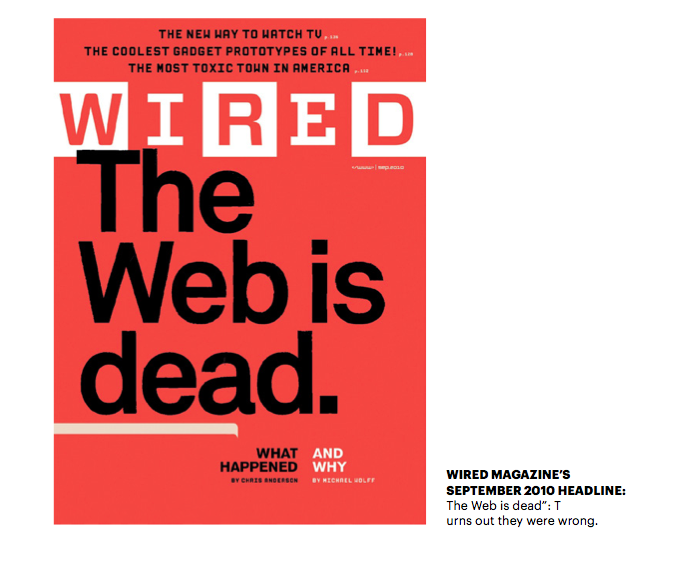 Remember Wired magazine’s September 2010 headline: “The Web Is Dead”? The arrival of what are called “Progressive Web Apps” (PWA) is beginning not only to level the playing field between native apps and web-based PWAs, but also to begin tilting the field in favour of the PWAs. Let’s start, however, by acknowledging the initial power of native apps. First of all, there are a billion of them. Well, not quite: There are almost five million apps in the Apple App Store and the Google Play app store combined, according to data firm mobile app analytics platform AppFigures. By 2020, there will be five million apps in the App Store alone, according to app intelligence firm Sensor Tower. And more apps are being created and sold every day. Apple’s App Store recorded its biggest revenue month ever in December 2016, according to Phil Schiller, the company’s senior vice president of worldwide marketing. The App Store made US$3 billion in revenue in December alone, from a combination of in-app purchases, paid downloads, and fees for subscriptions, Schiller told The Verge. In all of 2016,Apple made around US$8.57 billion in App Store revenue, he said. Most of the App Store revenue still comes from games, according to Schiller. If you have a hot, big-name game app or if you’re Facebook, yes, they’ll still come. 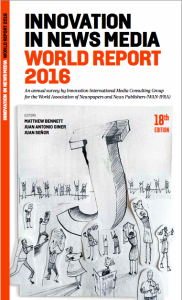 But few magazine media companies are in that stratosphere. 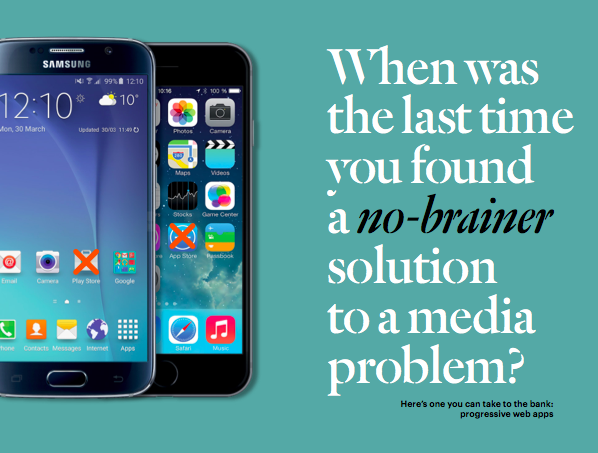 For most magazine media companies, the app boom, if it ever happened, is over. “The app store’s middle class is small and shrinking,” wrote Casey Newton, Silicon Valley editor of the tech site, The Verge. “The easy money is gone. For all but a few developers, the app store itself now resembles a lottery: for every breakout hit like Candy Crush, hundreds or even thousands of apps languish in obscurity. “Apps for massive social networks, on-demand services like Uber, and subscription businesses like Netflix and Spotify remain in high demand,” wrote Newton. “Then there’s gaming: Last year, 85 per cent of all app revenues went to games, according to App Annie. 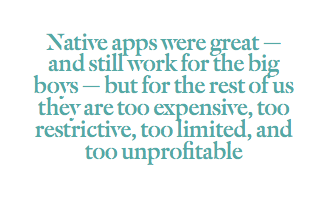 Nonetheless, the allure of being in the two big app stores still entices some media companies. “It’s easy to see how a lot of publishers end up with tens of thousands of dollars invested, months spent in developing and promoting the application, for a staggering 1 per cent converted into mobile app users from their already existing web traffic,” wrote Borodescu. “I would argue that being in an app store has no major advantage because it has been shown that if you are not in the top 0.1 per cent of apps in the app store, you are not getting significant benefit from being there,” Ada Rose Edwards, developer advocate for Samsung, explained to Borodescu. Native app install friction blocks 74 per cent of your potential customers before they can use your app, according to Chris Heilmann, Microsoft program manager for developer outreach, speaking at the Devternity development conference in Riga, Latvia in December 2016. By some accounts, 20 per cent of users drop out of the app installation process for every click required to get an app installed and running, Heilmann said. For example, if 1,000 users are interested in your app, only 800 will take the initiative to visit the app store, only 640 will successfully find your app, only 512 will click to install, only 410 will accept permissions, only 328 will wait for it to download, and only 262 will actually use it, said Heilmann. Native app critics argue that statistics like those indicate we have reached what Walt Mossberg, executive editor at tech site The Verge, calls “peak app”. “I think the novelty of the app itself has worn off — we’ve reached peak app,” wrote Mossberg on TechRepublic. “Just as there are too many confusing, often redundant choices on the breakfast cereal shelves at the grocery store, there are too many duplicative and puzzling choices in the Apple and Google Play app stores. “Given the plethora of (often bad) choices, we, as consumers, have given up on apps. I am not against apps as a software type. Just the opposite: I believe them to be crucial to mobile devices… And it’s still possible to create a sensation with a great app that introduces genuinely new experiences — like Pokémon Go,” wrote Mossberg. “But one reason Pokémon is so news- worthy is that such blockbuster apps are rarer and rarer. Unless an app becomes one of the three to five apps you use every day, “it could remain on your phone, gradually migrating to a place where it’s rarely seen or is always swiped past, until it’s finally deleted,” wrote Mossberg. Native app defenders, however, point to all those statistics about how much more time is spent on apps versus the mobile web. “People look at the data around the amount of time people spend in apps versus the web and mistakenly think that means people aren’t visiting mobile websites, or aren’t doing things on mobile web,” Jason Grigsby, co-founder of website builder Cloud 4, told Fast Company. “There is a large audience of people accessing the mobile web that you shouldn’t ignore — Comscore found that mobile web audiences are almost three times the size and growing twice as fast as app audiences,” said Grigsby. Across the top 50 mobile web properties, only 12 have more traffic coming from apps than the browser, according to research by Morgan Stanley and ComScore. And except for the highest-profile apps, consumers are increasingly resistant to downloading native software onto their devices, Max Lynch, co-founder and CEO of mobile app-builder Ionic, told FastCompany. Even if you’ve gone to the expense of building a native app (at US$50,000-$100,000 for a single app in both iOS and Android), “keep in mind that building an app is the easy part,” wrote Asay. “Next, you have to acquire users — according to Fiksu, that will run you US$1.46 (iOS) to US$1.15 (Android) per app download. I’ve heard of some companies paying upwards of US$70 per app download. “All of which sounds less appealing when you consider that roughly 52 per cent of apps lose half of their peak users after just three months,” again according to Flurry data, he wrote. And then you have to spend money to retain them. “The cost of retaining users, ironically, is even more expensive than acquiring them in the first place, according to Fiksu data: US$2.16 per user,” wrote Asay. To address all of these challenges, Google has spent years trying to make the mobile web apps as fast, useful, easy and seamless as native apps for iOS and Android, and less expensive to boot. A PWA in layman’s English? Let me try: If you go to a website that has been set up as a PWA, you don’t even know it. There are cool coding devices called service workers that are storing elements on your device to cut down on loading time when your connection is slow or non-existent. The PWA site can be set up to work and look just like a native app. And it’s learning. If you keep visiting the same website, then the browser (Chrome, Firefox, etc.) hosting the PWA will “ask” you if you’d like to get push notifications from the site when important stuff happens. If you continue to engage with the site, the attentive PWA will then ask if you’d like an icon for your mobile home screen, just like a native app. Presto, an app-like experience without the tedious, time-consuming, often frustrating visit to the app store ending in adding an app to your phone that eats up memory. Hence the term, “progressive” web apps. 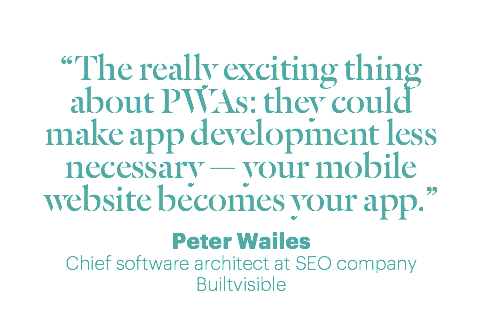 In a nutshell, “the really exciting thing about PWAs: they could make app development less necessary — your mobile website becomes your app,” wrote Peter Wailes, chief software architect at SEO company Builtvisible, on moz.com, “You will only need to develop a single ‘plat- form-agnostic’ version of your app and make it accessible to all potential users, no matter what device they are on,” wrote Antoni Zolciak, inbound marketing manager at tech solutions company InsaneLab on the company blog. Thanks to our friends, the service workers, PWAs collect and store data, enabling the PWA to function offline or on low-quality networks. PWAs are designed to mimic native apps, giving users the comfort of a familiar setting while retaining the full functionality of the web with dynamic data and database access. They can be designed to look just like a company’s existing native app and/or website. Progressive Web Apps consume 92 per cent less data compared to a native app, allowing them to better address users with slower phones or limited storage, according to Owen Campbell-Moore, product manager at Google. The app stores are increasing their regulatory hurdles that apps must clear, making the application and approval process for apps and app upgrades in Google Play, Windows Phone Apps, or Apple’s App Store a tedious and time-consuming process. With PWAs, developers can update the app without submitting it and waiting for approval from one of the app stores, allowing for up- dates at a pace not possible with native apps today. And readers don’t have to download anything to get those updates; they are downloaded automatically when users relaunch the progressive app. And, thanks to the ability of PWAs to use push notifications, media companies can let users know that an update has arrived. Progressive Web Apps are super fast thanks to the tech caches which can serve text, stylesheets, images and other content instantly. All PWAs must use the popular protocol called HTTPS to ensure secure communication over computer networks and protect the privacy and integrity of the exchanged data. Most media companies struggle to stand out among the 5 million available apps on the iOS App Store or Google Play Store. By contrast, PWAs can easily be found by organic or paid-search visitors, giving media companies a much greater chance of converting those visitors into PWA installs. Unlike native apps, a PWA does not require installation prior to using it. And also unlike native apps, PWAs don’t suffer the same “install friction” that stops 80 per cent of users who start the download process. Several browsers automatically prompt users to install the progressive web app icon after users have visited the PWA more than once. Those browsers send a call to action (CTA) in the browsers themselves, giving the installation request credibility, authority and reliability. One of the most important features of native apps is the ability for media companies to send push notifications out to their app audiences. PWAs also have that ability and it’s turning out to be popular with readers. “Out of all the people downloading a progressive web app, almost 60 per cent gave the PWA permission to publish push notifications,” wrote Pedersen. For magazine media with e-commerce built into their offerings, a PWA could mean an entirely new entry channel for sales, since push notifications directly displayed on phones are getting read far more often than either email newsletters or status updates on social media, according to Pedersen. “When you’re not in the app store, you’re not limited by the app store rules and you don’t have to pay the app store 30 per cent of sales,” wrote Cloud4’s Grigsby. Maintaining applications for multiple platforms is costly. “In the future, progressive web apps could reduce this cost by providing a single app that works on any platform,” wrote Grigsby. There’s a lot to like about PWAs. There is one fly in the ointment, but it may not be a problem for long. “Thankfully, there’s a Cordova plugin that adds service worker support to hybrid apps on iOS,” wrote Elliott. Even without iOS support of service workers, building a PWA can still increase adoption on iOS: AliExpress (Alibaba’s eBay) saw an 82 per cent increase in iOS conversion rate after building a PWA, according to Google. “If you think the lack of Apple support should hold you back, remember that Android is now 86 per cent of the global mobile OS market,” cautioned Elliott. 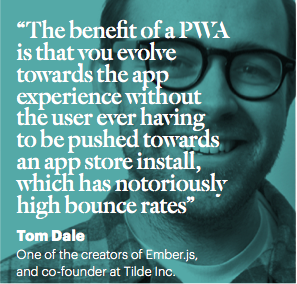 A PWA is one of those no-brainers that come along once in a blue moon. If you already have one or more native apps, maintain them, but build PWAs to capture the top-of-the-funnel users and convert them to the native app. If you don’t have a native app, go straight to building a PWA. And I’d hazard a guess that you’ll get many more engaged users, none of whom will ask you why you don’t have a native app in the app store!